The Israeli leader, in a series of Twitter posts by Gendelman, cited the large number of Telegram followers and noted that “millions of people” have seen the video he made promoting the water offer to Iran. He even hopes that someday he can talk to the Iranian people in person—in the Iranian capital. 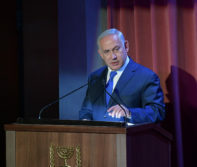 “To every Iranian mother, father, student and activist, I promise you one thing: Israel will never lose faith in the promise of peace and friendship between us,” Netanyahu was quoted as saying. Netanyahu’s Youtube video on the water program pointed out that almost 96% of Iran “suffers from some levels of drought,” highlighting that Israel handles their own “water challenges” with massive wastewater recycling and drip irrigation that more efficiently waters plants.